Here's the kitchen reveal , Part Two! The kitchen really is the heart of our house. I love to cook, and we try to have our friends and family around our dinner table often. With the extra space of the keeping room, I was stoked to have a place to linger before or after dinner. 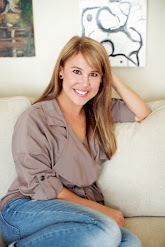 Over the last little while, I've been Pinning some fun things that caught my eye for the kitchen. So, without further ado...here's my Pin-spiration pics and the final look. 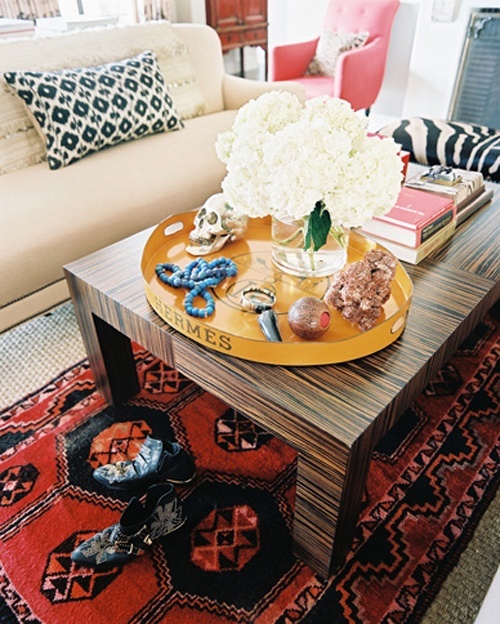 I love the look of layered rugs. Orientals over jutes is fabo to me. My darling hubs gave me a gorgeous rug for our anniversary this year, and I have been itching to layer it. 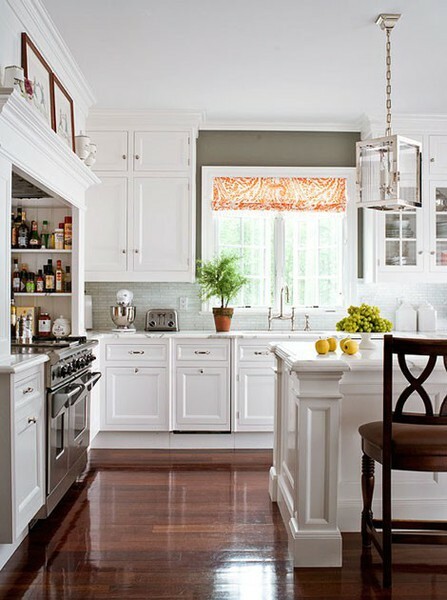 I have ALWAYS loved white kitchens. 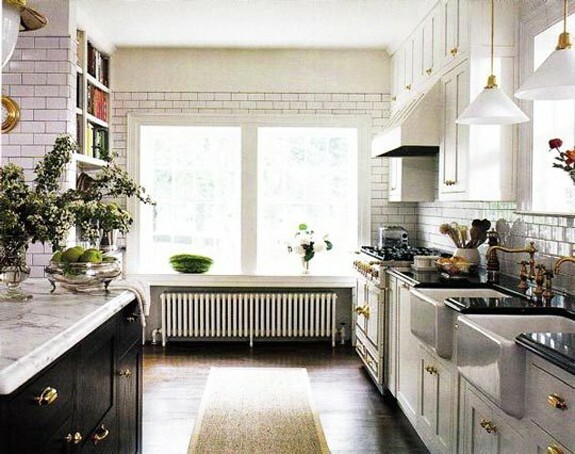 Really, the whiter the better....white cabinetry, white backsplash, white countertops, white dishes. So, interestingly enough, all of my Pins were light and bright like this one. 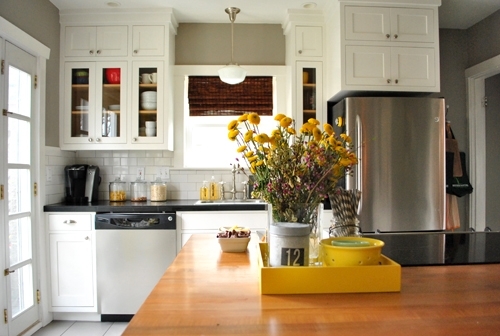 These cabinets are a soft gray, and I heart them too. I die over those pendant lights. This room utilized one of my favorite things - floor to ceiling subway tile with gray grout. How chic is this? This needs no words. Those marble countertops are crazy cool. I have a little hutch that belonged to my grandparents - I love it filled with my white Juliska. This further reiterated my love. I am nutty over this color palette of putty, blue, and cream. Remember that little square table I posted about yesterday? The one in my old basement? 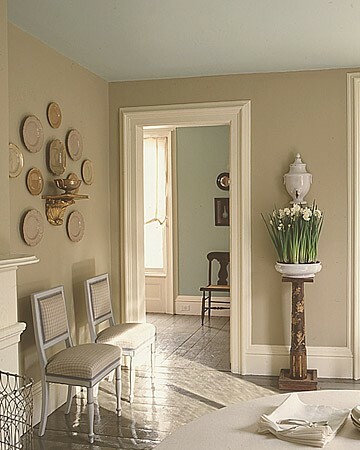 Well, this was the inspiration for its facelift - a gray painted table with gold edging. This is pretty much what pushed me to go with gray walls. 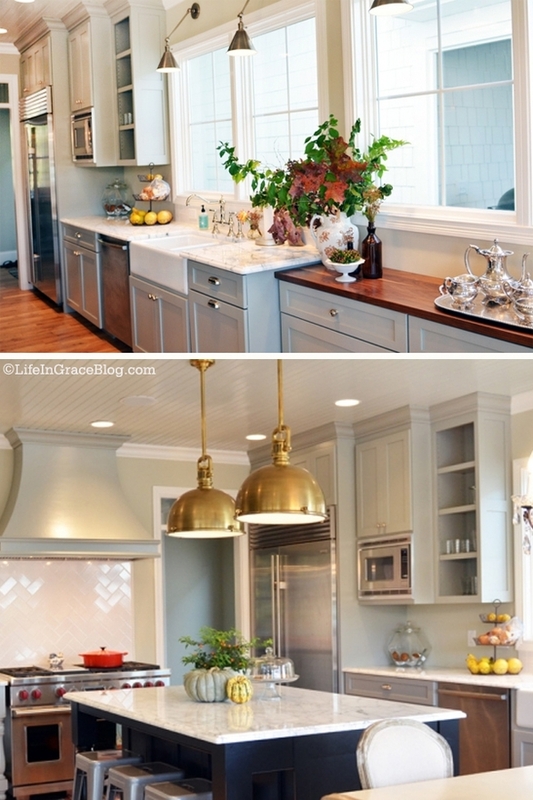 I just love it all...esp that range and the island lantern. As a Southerner, I do love plates. And I knew there was a perfect wall for a few.. If you recall, in our old house, there was a little green settee in our kitchen. That settee belonged to my grandmother Baboo and has been passed from a few family members on to me. Lucky me! 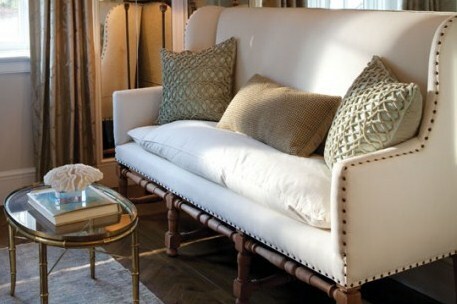 There was a matching ottoman that had been in storage too, and both pieces needed new upholstery. I happened upon this inspiration Pin and knew this was the look I wanted. Here's one more look at the "before." 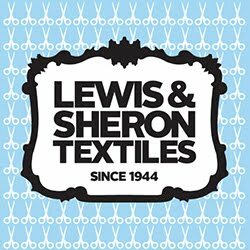 During a pit stop at Hancock's, I found a linen blend fabric on MAJA sale and grabbed 16 yards of it before anyone else could! So, the green chenille was being replaced with a new neutral fabric. Now, our floors are completed and we are in love with them!!! Our breakfast area is surrounded by windows and under two sky lights - I love the sunroom feel. Oh yea, I also had the doors painted black. How fun is that?!?! The culmination of four separate "Pins"...the plate collection, the settee's new upholstery, the painted table, and the layered rugs. We love sitting here. An adorable friend gave me these fabulous wildflowers that are drying beautifully. We really love the way this room turned out! The floors are a dark walnut (love it! 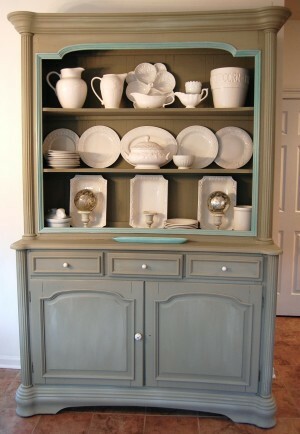 ), the walls are Thunder, cabinets are Mascarpone, and island is Wrought Iron - all by Benjamin Moore. The barstools were a Ballard Designs clearance find at the beginning of the year. The island granite, the tiled counters and tiled backsplash are all original. I chose a combination of 3 separate hardware styles for the cabinets. There's "cup" pulls on most of the drawers, and a smaller knob on a few others. The vertical cabinets all have the brushed stainless sleek pulls. The tile counters and backsplash are o-kay for now, but I am trying to hide the painted flowers...they're pretty, just a different look. A Sleepy Poet pilgrimage in Charlotte produced these vintage canisters. I think they're so fun! Here is a better shot of the vibrant colors in the rug from my Hottie Hubs...he's got fabulous taste! I just love the plates' blues and creams against the gray walls and paired with my little French painting. The larger oyster plates were found locally, while the small ones were grabbed from Smith's Antique Mall in Destin. The cappuccino rimmed plates came from my Mama Doris' house, and my super Mom brought the creamware for me from England. The white antlers I've had for a while are now over a pretty white platter I received for a wedding gift. There's more to show - we've worked hard on the other parts of the house too! Can't wait for you to see what else we've done! Maggie, so beautiful! LOVE LOVE Love.. can't wait to see the rest of your neew house! Everything looks fabulous. So comforting and inviting. I see many morning chats with coffee in hand in the kitchen sofa area. I love how bright it is!! It is gorgeous! Love the finished kitchen Maggie! The floors look amazing! you really did a beautiful job! I love how bright & fresh everything looks.